It’s not easy to sell… but having a process to follow will help streamline things for you. 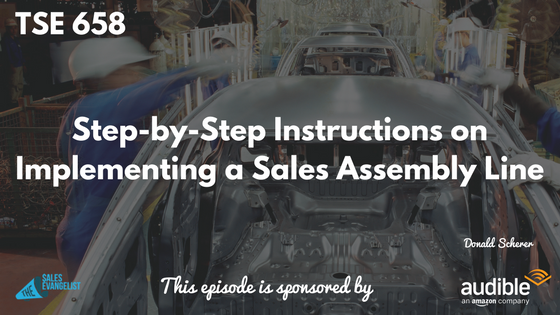 Today, we talk about the idea of an assembly line for your sales process. Donald is a New York tax attorney turned entrepreneur. 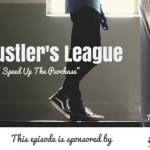 He sold his first company which he created with his mom and did it out of bootstrapping. He is the Co-Founder and CEO of CrossBorder Solutions, which he grew into one of the world’s largest tax software companies. Donald has also written a book, Assembly Required. It talks about this whole concept and how to implement it. The sales person goes out on the road, sets up appointments, does the presentation, builds a relationship, does the paperwork. Sometimes, he even takes care of the customer at the end of it. Mathematically, it’s almost impossible to scale this type of operation. It’s expensive and it’s ineffective. It’s works very nicely when working with early adopters in the beginning when you’re launching your product. But it’s not a scalable model. If you don’t scale your sales operation within the first four years and become the market leader, you’re going to fail. So one company in any market actually succeeds. Most companies fail because they’re not able to scale it. You have people that have set roles over and over again. You don’t have people that play many roles. In sales, you set up an SDR (sales development rep) whose role is only to set appointments. Have someone else specialize in doing research and another one doing the calling. If you have a very skilled worker, don’t let them do anything else but their where their skills at. Let your account executives don’t do anything but close. And if they don’t close in three months, the client goes to an incubator professional who keeps them warm. Then send it back to the salesperson. Determine what the best practices are through A/B testing. 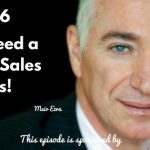 What is working in the sales environment? Then make sure every person along the line is doing the thing that works every time, repeatable, over and over again. Once you have a repeatable sales process, now you can scale. Don has built the sales assembly line software (available at www.assemblysales.com) which they use rather than a traditional CRM process. The key is to have multiple different people playing multiple singular roles along the line. If you’re specializing, you can optimize the commission structure. By breaking up your roles, it allows you to target your commissions properly and keep more internally for the house. Should the VP of Sales have control of everything? Don doesn’t think the VP of Sales should control the whole thing. Since they often lead not just with knowledge but they lead with their people. Instead, the marketing group controls the SDR and the callers. The VP of Sales controls the account executives. Then put customer success and upsells under VP of Customer Success. Nobody actually has control of the entire process. So if you have 100 demos and a close rate of 10% at $15,000 then that’s what you’re going to make on a monthly basis. When you have enough impression, usually it stays the same. So you can predict what your sales is going to be on any given time period. Don’t go door-to-door to sell. Use a web meeting software like WebEx or GoToMeeting to do your sales. It allows you to see enough client and do value. If done right, the close rate with a web meeting client is higher than with a door-to-door meeting. It’s much easier to build relationships over the web if done correctly. Know more about Donald and if you’re interested in his assembly line software, visit www.assemblysales.com. Connect with him through email at donald.scherer@assemblysales.com. Play Bigger by Al Ramadan, et al.